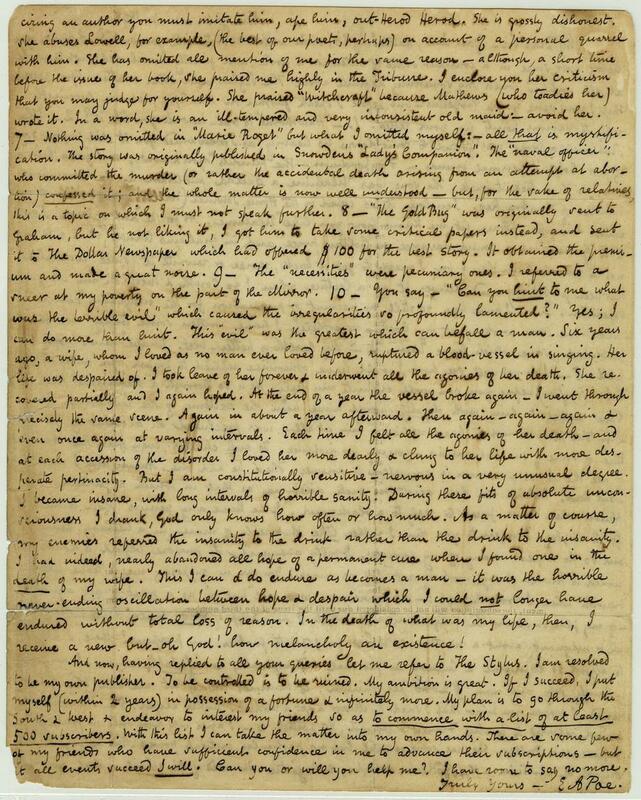 Edgar Allan Poe: A letter to a fan in which he tells the story of Virginia Poe's death. In a passage buried deep in this long letter full of business chatter and gossip, Edgar Allan Poe recounts the story of his wife Virginia’s 1847 death from tuberculosis and describes his own desperate reaction. The Harry Ransom Center’s former curator Molly Schwartzburg, who wrote about this 1848 letter for the archive’s blog, reports that Poe’s correspondent, George Washington Eveleth, was a fan who first wrote to Poe in 1845. Over the years, Poe exchanged several letters with Eveleth, who asked about his publication plans, literary choices, and feuds with other writers. In 1846, Poe wrote a letter to the Philadelphia newspaper Spirit of the Times responding to a fellow writer’s accusations of plagiarism and other literary sins. In defending himself, Poe elliptically mentioned that he had been suffering from the effects of what he called a “terrible evil.” In the letter that prompted this response, Eveleth asked what evil that might be. Poe was famously prone to alcoholic sprees during the 1840s, and his “enemies” (as he calls them) thought that his irregular behavior was due to his drinking. Here, he writes that the stress and pain of his wife’s illness was the cause of both his alcoholism and his “insanity.” By the end of the passage, Poe has said—in a turn of phrase that’s shocking to read—that his wife’s death was a “permanent cure” to this insanity. While this phrase may have been used for literary effect, by 1849, Poe’s life did appear to have taken a turn for the better. He had a new editorial project underway and had proposed marriage to another woman when he died under mysterious circumstances in a Baltimore hospital. 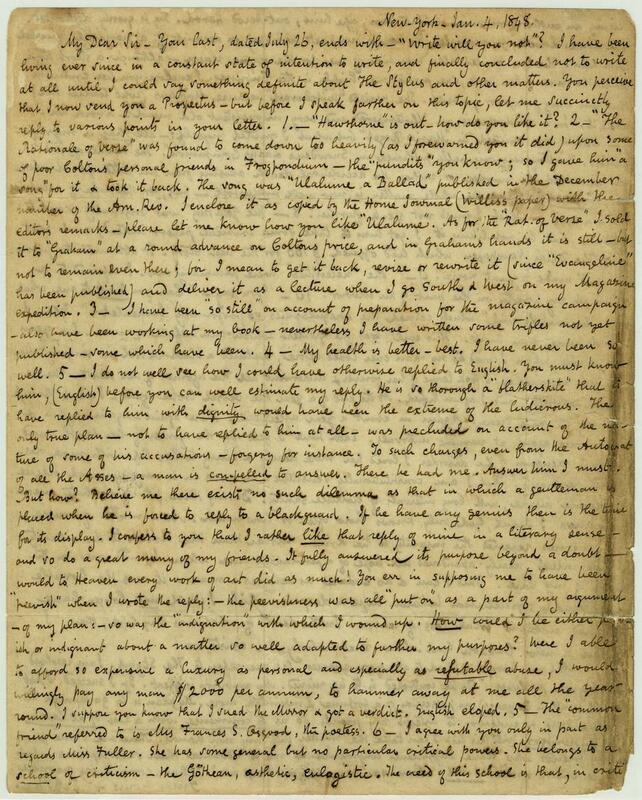 Many of the Ransom Center’s Poe materials are digitized, and can be seen here. A transcript of the relevant passage follows these images. A transcript of the full letter can be found on the Edgar Allan Poe Society’s website. A letter from Edgar Allan Poe to George Washington Eveleth, 4 January 1848. Image courtesy of the Harry Ransom Center. Letter from Edgar Allan Poe to George Washington Eveleth, 4 January 1848. Image courtesy of the Harry Ransom Center. 10 — You say —”Can you hint to me what was the terrible evil” which caused the irregularities so profoundly lamented?” Yes; I can do more than hint. This “evil” was the greatest which can befall a man. Six years ago, a wife, whom I loved as no man ever loved before, ruptured a blood-vessel in singing. Her life was despaired of. I took leave of her forever & underwent all the agonies of her death. She recovered partially and I again hoped. At the end of a year the vessel broke again — I went through precisely the same scene. Again in about a year afterward. Then again — again — again & even once again at varying intervals. Each time I felt all the agonies of her death — and at each accession of the disorder I loved her more dearly & clung to her life with more desperate pertinacity. But I am constitutionally sensitive — nervous in a very unusual degree. I became insane, with long intervals of horrible sanity. During these fits of absolute unconsciousness I drank, God only knows how often or how much. As a matter of course, my enemies referred the insanity to the drink rather than the drink to the insanity. I had indeed, nearly abandoned all hope of a permanent cure when I found one in the death of my wife. This I can & do endure as becomes a man — it was the horrible never-ending oscillation between hope & despair which I could not longer have endured without the total loss of reason. In the death of what was my life, then, I receive a new but — oh God! how melancholy an existence.